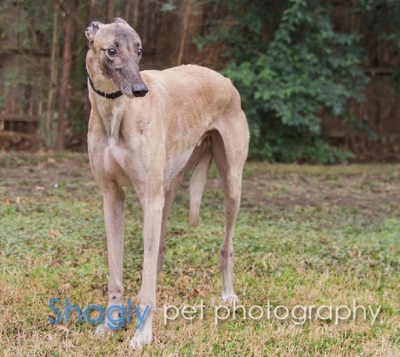 Knight is a 5 year old fawn male born in 2013. He was part of the population from the blood bank facility located in Cherokee, TX that closed in November 2017. 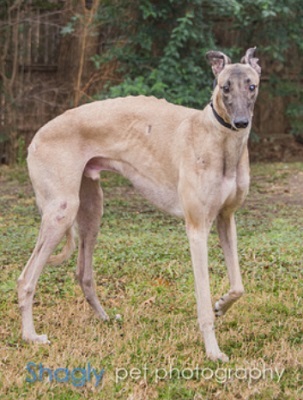 Knight has been successfully treated for a positive titer to Ehrlichia Canis and has completed all his medical procedures. Knight was seen by Dr. Rachel Ring of Animal Ophthalmology Associates was diagnosed with corneal edema,which is water on his cornea. His condition has improved dramatically, and he continues to take daily eye drops. It is not known at this time if Knight is small animal or cat tolerant. When he arrived, Knight had significant vision problems which caused him to be fearful of all noises. Over the months his eyesight has improved and he’s come a long way from being afraid of every sound outside. At the present time he is still on prescription eye drops. Knight now watches the other dogs’ reactions and if they don’t mind, he won’t be “as scared”. We give him a lot of encouragement and it seems to be paying off. Bad weather still causes some angst so we put on Knight’s armor (a stylish thunder-shirt) and he braves the storm. During the spring rains he kept it on for days and did greyt. Knight loves hanging with his peeps and his dog buddies. He has a good full-body lean when standing nearby – so much so that we have to brace ourselves to avoid falling. Mealtime is the bestest part of the day – he’s a bit of a messy eater so we feed him away from others to allow him to clean up after himself. This boy is quite the sleeper – mouth open, eyes open and he snores. Sometimes it’s more of a purr, other times it’s downright funny human-like snore. When it’s nighty night time he finds an open dog bed in our bedroom and sleeps through the night. If he wakes up early he does a big shake and the jingle of his tags is enough to gently wake us up – that or sticking a cold nose in your arm does the trick! Knight doesn’t like closed in spaces so we don’t crate him when we go out. He’s not a counter surfer and relaxes with some music until we return. Knight enjoys a good face rub and being lavished with kisses. He is gently guided with a light touch on his neck. Squeaky toys are a big player and he will move toys around the house from time to time. When it comes to going on a walk, he’s still a little tentative and continues to improve with time. Car rides are good and he jumps in with ease though he’s not always sure he wants to get out. Knight’s noble home should have a canine companion or two and a nice yard without too many noises. Is there a spot in your fiefdom for the Knight of the round slumberball so you can say nighty-night Knight every night?